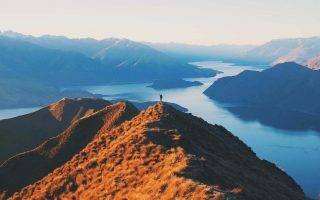 New Zealand’s South Island is a magnet for thrill-seekers – but Taupo in the North Island packs an adrenaline punch too. 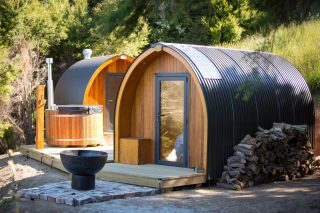 Just two hours south-west of Hawkes Bay on the shores of Lake Taupo – a region famous for its boiling mud pools, bubbling craters and steaming geysers – the tiny town is the epicentre of action-packed outdoor adventures. 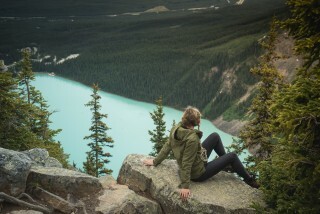 New Zealand’s highest water touch bungy jump is in Taupo, as well as its best one-day hike; the Tongariro Alpine Crossing is a trail that skirts active volcanoes, craters and emerald lakes in the dual World Heritage-listed Tongariro National Park. 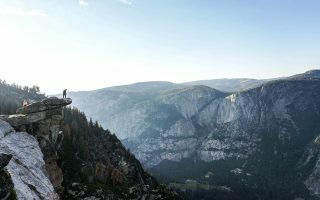 Hop on a mountain bike and navigate hairpin bends and vertical drops on some of the most stunning on and off-road locations. Or, join the tens of thousands of solo and tandem skydivers who take to the sky each year in what’s fast becoming the skydiving capital of the world. 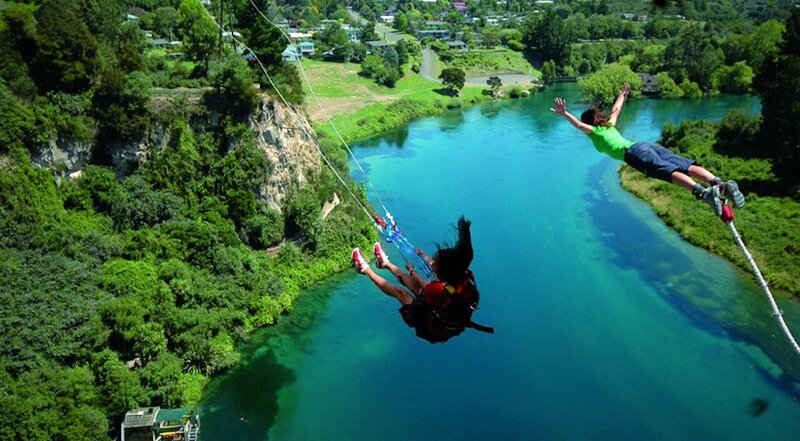 Here’s what else the adrenalin junkie in you should definitely get on the bucket list prior to a trip to New Zealand’s Taupo. Huka Falls is New Zealand’s most visited attraction for good reason – every second more than 220,000 litres of water blasts through a rocky bottleneck of the Waikato River in a formidable display of raw hydroelectric power. Watch it from above, and then take to the waters with Rapids Jet. 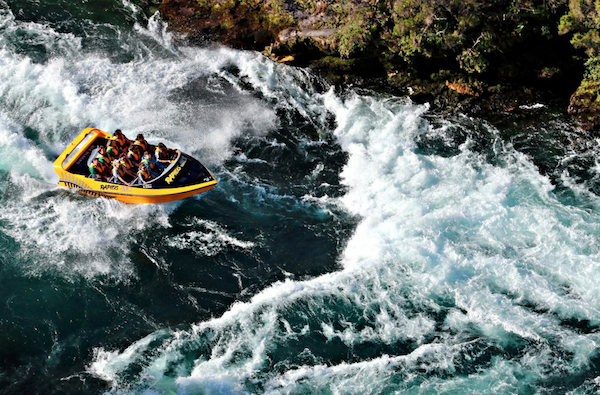 The high-powered jet boat ride shoots people up a narrow gorge of the Waikato River where the dam waters release, then bounces and spins the boat full-pelt into the rapids. For a thrill of a different kind, make tracks to Turangi, a quaint fishing town. Here, Tongariro River Rafting takes people on grade-three river rafting adventures through stunning forested gorges and more than 50 swirling rapids on a wild two-and-a-half-hour ride. 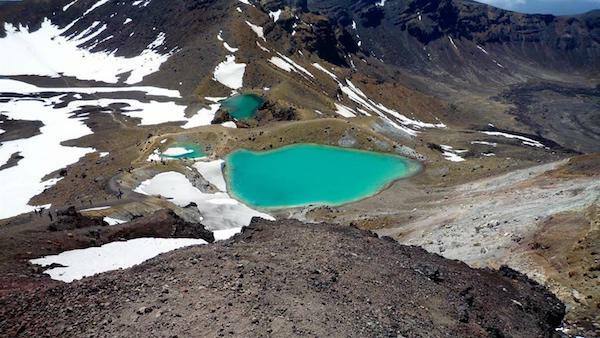 Remote wilderness adventures are just one short helicopter ride away in Taupo. 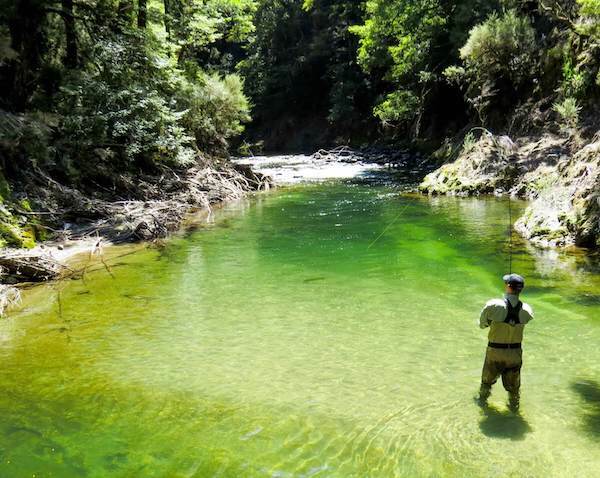 Luxury sports lodge Poronui drops guests off for the day on private Maori backcountry to stalk, hunt and hook easily spooked river trout. 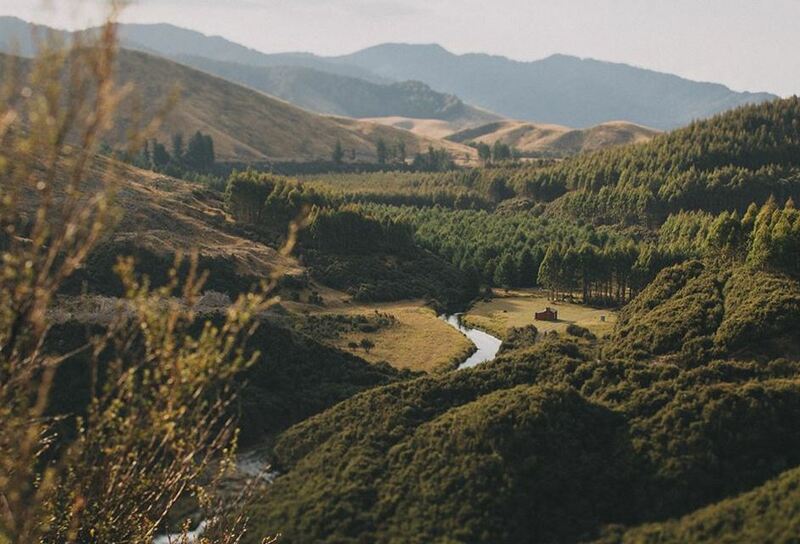 The Oamaru Trail, a sensational six-hour hike in the Kaimanawa State Forest is the location of guided hikes for up to four people with Chris Jolly Outdoors. Expect breathtaking views of canyons, golden plains and mossy forests. 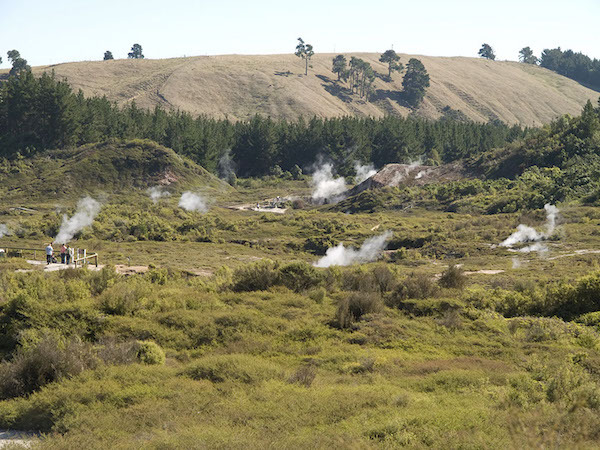 Taupo is a hotbed of geothermal activity. On a drive through town, visitors can see the white plumes of steam where hot water has broken through the ground. Explore this steamy otherworld up close at the geothermal park Craters of the Moon, or soak in the mineral-rich hot springs at adult-only Wairakei Terraces. Lake Taupo, the world’s second largest crater lake, is the hole left in the summit when a supervolcano blew its top. 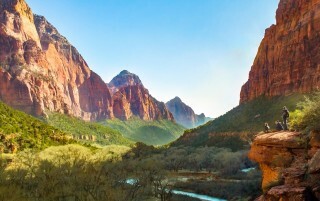 The hole or caldera is the size of Singapore and brimming with rainbow trout. To get a sense of its magnitude, head out on a cruise or kayak of the lake. Better yet, jump aboard Taupo Floatplane, a twin engine Cessna, on a flyover of the lake. Further south is Tongariro National Park and its three volcanoes that starred in scenes of Lord Of The Rings. 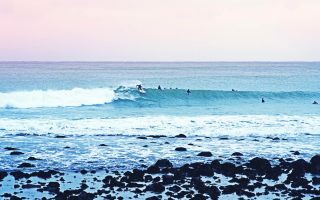 Ski or snowboard past the crater on Mt Ruapehu’s active slopes, or walk the desolate path to Mt Ngauruhoe – the gloomy Mount Doom of Tolkien’s Middle Earth. Check out Qantas flights to book your next adventure in Taupo.